You will be picked up at your hotel at 08.45 and meet with other rafters at our base. While socializing around a cup of coffee, we will help you to select your rafting equipment (helmet and life jacket). After a safety briefing, we will drive one hour by pick up taxi to reach the put in point. Around 11:00 you will meet your captains and receive the last paddling instructions. 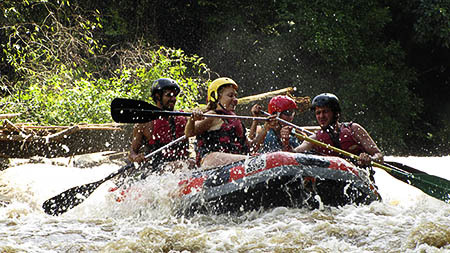 The first strokes will take you straight into the lush of the jungle; after the first rapids, you will stop for a basket lunch by the shade of a wild mango tree; Then, passing through the gorge, you will experience the thrill of the class 3-4 Fragrance Rapids, before you reach the first hot springs and fluoride mine area of geological interest. 15 more rapids and we will stop at a small waterfall to enjoy water games. Then, following the meanders of the river through the deep jungle, we will stop at our camp (17:00); you will settle in your huts or tents, take a shower, relax or explore the area before we serve a welcome drink and local snacks. Later, a delicious Thai dinner cooked by the guides on the wood fire will follow (vegetarian on request); then fruit, coffee, tea, will complete the menu while guides will show you some tricks of their own getting tired, you will enjoy to spend the night in harmony with the nature, in a bamboo hut fully furnished with sleeping bags, pillows and mosquito nets. Shower & toilets are simple and clean facilities with bamboo walls. ￼A filling breakfast including homemade bread, eggs and fresh coffee will be served at 8 am. Departing from the camp around 9 am, we will first enjoy a dozen rapids among which the class 3 Red Cliff. Further down, we will reach the Khong River junction, most important tributary of the Pai river; a few minutes later, the expedition will take a break at the main hot springs on this trip and will get ready for more fun through the set of the Rising Stone Rapids (about 5 rapids from 100 to 400 meters long, grade 2-3 ); after such a thrill, a picnic will be served on the bank of a clear stream; then, you will paddle or enjoy swimming through the Pai Gorges scattered with few more tricky rapids. Coming to the end of the journey, we will pop out into the Mae Hong Son Valley and meet the first farming areas. We will disembark at the Forestry Headquarters at around 15:00; there you will be able to redeem your main luggage and take a refreshing shower before a short transfer to Mae Hong Son at the place of your convenience: Hotel if you wish to discover this charming Thai-Burmese city or Airport to fly back to Chiangmai at 16:10. A transfer back to Pai (110 km / 2 h) is also available with our truck. 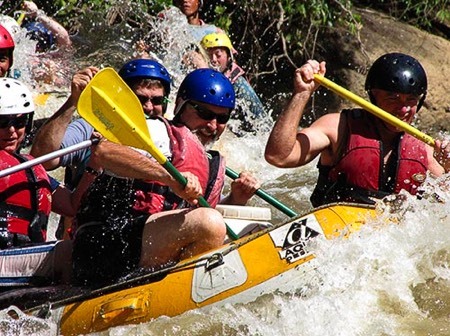 Located in the foothills of the Himalayas, the Pai river, thanks to an excellent compromise between wilderness, challenge and safety, offers one of the best rafting expedition spot in the world. It will exceed a beginners expectations and surprise the outdoor enthusiasts. 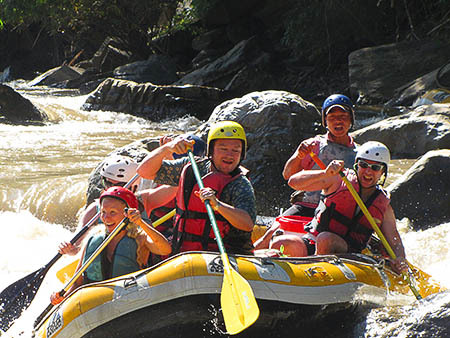 The middle section of the Pai River stretches over 60 kilometers of rocky landscapes and non-accessible jungle forest; it offers fun through as much as 60 rapids up to class 4. You will discover hot springs, swim in gorges, shower under waterfalls, surprise colorful birds and other wild animals in their environment. You will stay overnight in a jungle camp in harmony with the nature. The trip ends 110 km from Pai, in Mae Hong Son, the romantic Shan city, close to the Burmese border and the famous Karen Long Necks villages. Each expedition travels in sturdy inflatable rubber boats controlled by English speaking captains trained on an international standard level. They will ensure that you feel safe at all times and they will be happy to share with you their knowledge of the Mae Hong Son province.